Isabella Tremont, Duchess of March, is that rare creature, a duchess not because she married a duke but because she inherits the title in the absence of a male heir. Her particular circumstances make her the only female member of the Prince Regent’s Royal Entourage. She was present the night that the behavior of the Prince and England’s highest ranking aristocrats became so outrageous that it endangered the monarchy. The tumult has largely subsided, but England’s dukes—and duchess—are still under royal orders to marry and settle down. Isabella is a favorite of the Prince, and she receives regular communications from him urging her to select a husband. He even goes so far as to supply a list of eligible gentleman. The Prince is equally eager to see England’s premier duke, the Duke of Candover, wed. It seems to Isabella that she has been in love with the Duke of Candover all of her life. He, as much as her father, taught her the things she needed to know to manage the duchy, and he did it so well that Isabella, despite her youth, excels at managing all her responsibilities. Unlike her father, Candover believed that she was wise enough and strong enough and brave enough to be a duchess. It was also Candover who taught her, albeit unwittingly, that the sound of a man’s voice could make her knees weak and his rare smile could make her tremble. But she thinks she lacks the beauty and sophistication to attract Candover. Isabella summons every ounce of courage she possesses to propose that she and Candover solve their mutual spouse-finding problem by marrying one another. When he rejects her offer, Isabella is humiliated. Honor is supremely important to James Fitzroy, Duke of Candover. He is committed to his ducal responsibilities and to his brotherly duties. He is loyal to a fault, and he is a man who is true to his word, whatever the cost. Isabella’s father was Candover’s godfather, a man Candover admired and one who was kinder to him than was his own father. The Duke of March married a much younger woman with disastrous results, and he was determined that Isabella marry a man near her own age. He asks Candover to pledge his word that he will ensure that Isabella does not marry an older man. Candover promised, and now neither the tenderness Isabella evokes in him nor the desire that requires all his control to master will make him false to that promise. But he is unprepared for the devastation watching Isabella flirt with the eligibles on the Prince’s list brings and for the rage that fills him at the thought of her in another man’s arms. 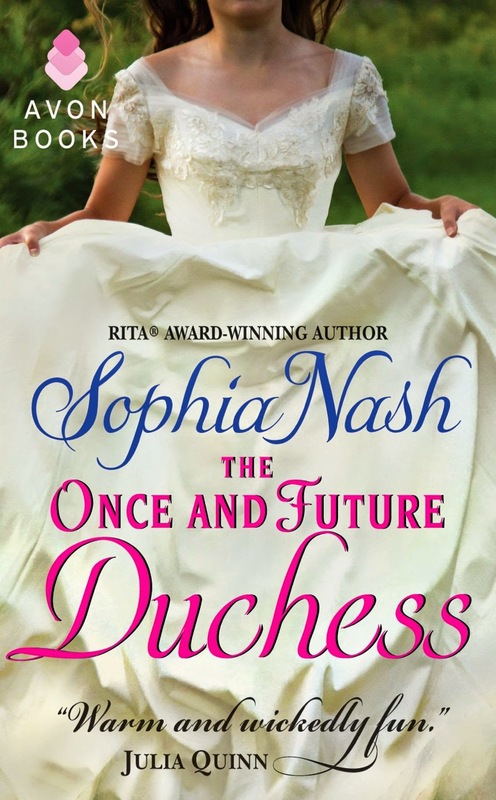 The Once and Future Duchess is the fourth, and according to rumor, the final book in Sophia Nash’s Royal Entourage series. I love the series and have impatiently awaited the book in which the cool, mysterious Candover would catch fire and have his secrets revealed. But, having read it, I have mixed feelings about it. I loved the characters. Isabella is all that Candover assured her father she was, and certainly she is wise beyond her eighteen years. But she is also poignantly lonely at times, even more so when it seems that her friendship with Candover has been shattered beyond repair. She and Candover are alike in their essential aloneness. His secret and his heavy sense of being responsible for the well-being and happiness of those important to him mean that not even those closest to him are admitted to true intimacy. I was deeply invested in these characters and in seeing them arrive at their HEA, which, although a consummation devoutly to be wished, often appeared to be a faint hope. I also loved seeing characters from earlier books. Despite my affection for the characters, however, if this is the final book in the series, I hate the loose threads. The Duke of Sussex makes me laugh, and I was very pleased with his match. Nevertheless, I really wanted more of his story than the reader gets in the rather rushed secondary romance. I adore the Duke of Barry! He is my kind of hero, and, while his HEA is suggested, I think he deserves the full treatment complete with kisses and sighs. Finally, there is Calliope Little, Isabella’s young cousin. She is a scene-stealing delight in the tradition of Josie Essex and Minerva Highwood, and, like them, she demands her own book. If this is the last book, I feel cheated. If it’s not, I will willingly wait another year or more for the romance of Barry and Mary (please) and for Calliope’s story. I think The Once and Future Duchess can be read as a standalone, although a reader new to the series will miss various nuances. I recommend the full series, but this book offers its own particular rewards. My frustrations with the loose threads aside, I found much to love in this book, and I was once again reminded that Sophia Nash is a wonderful—and underappreciated—romance author. I have not read any of Sophia Nash's books. I will check for her books as I am intrigued by your review of her Royal Entourage series. She's a wonderful author, Laurie. I highly recommend her books. I enjoyed the book greatly--the whole series really--but like you felt, "What? Is this the end of the series?" and was disturbed by some of the loose threads when I wanted a book for Barry and Mary; and a book for the Duke of Sussex more than what was given here...I'd like to see it from their POVs in depth, but that's just me. This one is on my list as well. So, looking forward to reading it. This sounds wonderful - thanks for the review! I've not yet read any of this series. Sounds like I will have to remedy that. These two are the type of characters I really like. I do prefer to read a full series and do them in order. Will be checking my TBR Mountain and get what I don't have.